The aggressive styling found on this beautifully crafted top grain leather sectional sofa by Contemporary Plan is in a class all its own. 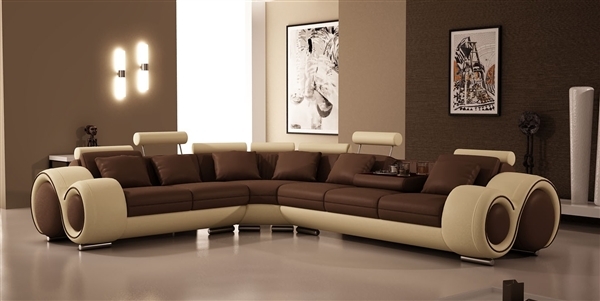 The two tone color combinations and chunky brushed chrome legs bring the entire look together. You'll appreciate the comfort provided via the adjustable headrests and the quality is impeccable. This is a sofa you'll want to show off at every opportunity and the solid hardwood framing ensures those opportunities for many years. 2 seater: L-51" D-41" H-30"
3 seater: L-72" D-41" H-30"
Only solid hardwood products are used in the frame construction. All corners are "blocked", nailed, and glued for strength and durability.